Happy 2016, gentle readers! Here is Felix from 12-3 to 12-9-1934. All the dailies are set near Felix’s new home, a hollow tree. In the 12-7, we see a typical Messmer human (a burglar, naturally), made of very rounded shapes. I love how the checked pants define his stomach and legs in the second panel. This story continues soon. In the Sunday, Felix loses another home as he sets up listening tubes for his alley cat friends, which they use as kitty entrance pipes. 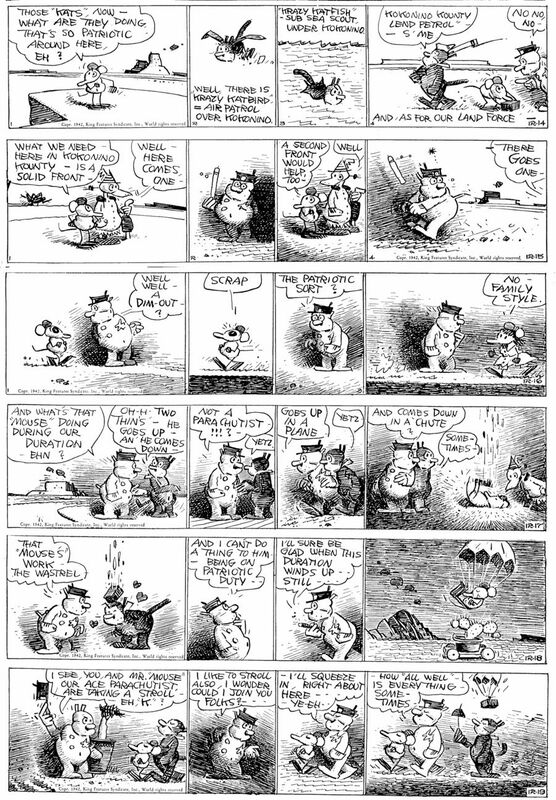 I love Messmer’s knack for designing cartoon cats, you can see that in the third panel and in the last row. Myrtle is from 9-6 to 9-12-1948 this time out. The first two dailies form a story, as Myrtle sticks her tongue out at Bingo, and Sampson follows suit. The 9-9 has some of the unique Dudley Fisher gag timing, as Bingo holds a dime in his mouth to fool Sampson, only to swallow the ten cent piece in the last panel when Myrtle is paying for a soda! The Sunday is a two-panel masterpiece of composition and story. You can almost start anywhere on the page and get a main story point (the burglary), and all the character’s reactions. Hyacinth the cat makes a rare appearance in the second panel on the right hand side of the page. World War Two, referred to by Garge as “Our Duration”, continues to set the background for the gags in Krazy Kat from 12-14 to 12-19-1942. Even the peaceful Krazy does soldier duty for Kokonino Kounty in the “Lend Patrol” in the 12-14. There are references to “Dim-Outs”, “Second Front”s and in the 12-17 to 12-19 dailies, Ignatz proves to be an inexpert parachutist. Ig manages to sneak a brick past Offissa Pupp in the 12-19, by parachute! Thanks all youse guys and gals, for sticking with the Catblog throughout 2015. We’ll sho try to give you the mosta of the besta in the coming year. This entry was posted on Saturday, January 2nd, 2016 at 5:23 pm and is filed under Uncategorized. You can follow any responses to this entry through the RSS 2.0 feed. You can skip to the end and leave a response. Pinging is currently not allowed. I also like how Laura looks at things sideways, like an actual parrot with eyes at the sides of its head would.